We’re not taking any major vacations this year since we just moved. We’re hanging out in an apartment for a few months while we search for a house. So while we’ve had lots of fun exploring our new city, we’ve also had to be creative with activities for apartment life. So, we had a little mini-retreat this past week and the kids enjoyed a living room camp out. We had a movie night! And the kids slept in their living room tent! This is the only kind of camping that you will ever find me doing-it comes with A/C, a private bathroom and shower, and a kitchen with a fridge. There are no bugs, no dirt, no rain, no heat, and no stray animals. The best part of our little staycation was that I could still sleep in my bed with my pillow. 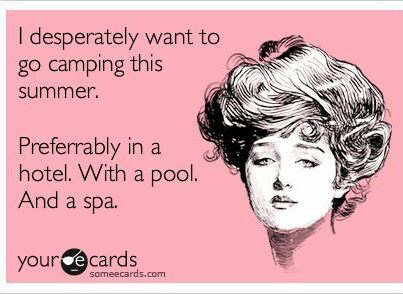 That would be my adult version of a summer staycation. Read about other staycation ideas in the Review Crew Blog Cruise! This is a great idea! Sounds like a really fun family night…not to mention a PERFECT reason to make and eat s'mores! I'm thinking a living room camping night is definitely in our future. I will take any excuse I can find to make s'mores! This was my summertime reason to make one of our favorite treats!